Not Home Depot or Lowe’s. No. 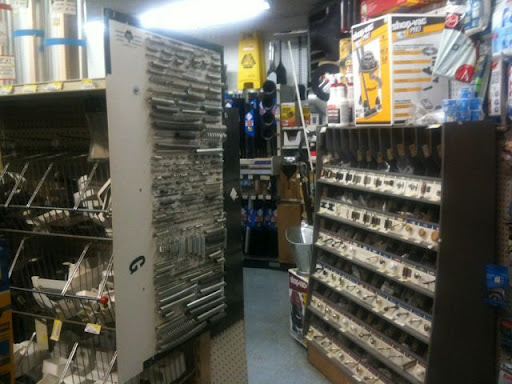 Hardware stores. Everything is packed in so tightly there’s no free shelf space anywhere. Lots and lots and lots of little bins of things. Price tag stickers from pricing guns from twenty years ago. Nails, screws, bolts. Hardware. 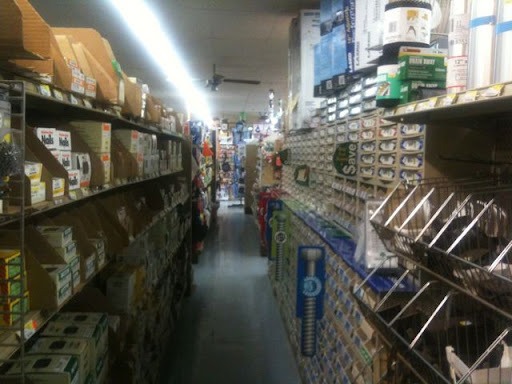 I love being in the aisles at a real hardware store. It’s like being in a library in a lot of ways for me. Walking slowly up and down the aisle, considering just how that particular thing might be used, getting ideas for things, losing myself (interesting typo, I wrote “my self”) in my thoughts. How do they keep it so tidy? This is a train of thought I always visit and never enjoy. When I worked in retail I was horrible at keeping the store looking good. I’m not a tidy person by nature. So the idea of keeping all of those thousands of pieces in such an orderly state stresses me out. Oh, and “inventory.” Yikes. What a nightmare. I would always be the worst person to have doing the inventory jobs because I just didn’t care how many there were. “Yeah, that’s about right,” and I’d put the number on the paper. Mostly I don’t get distracted by what it takes to get it this way. Mostly I love to linger. Today I found myself a bit flogged by anxiety feeling someone might come at me at any moment to ask if I needed help. I don’t mind that. It’s a retail establishment, after all. But I have found hardware store staff tend to be a little agressive with the “LET ME HELP YOU” stuff. Today I was all prepared to say, “I know this is weird, but I just like looking around.” I realized that was the simplest solution. The tinge of anxiety made my visit a little less meditative, but it was still good. No one bothered me anyway, after all. Up and down the aisle, the smells of oil and metal and dust. So many tiny things forming larger shapes, so many versions of one kind of tool. When I came home to my apartment I had some screws that won’t fall out of the wall. Or, rather, the next ones I put in won’t fall out of the wall when I re-do hanging the shelf. The first two will because I was super impatient and ended up practically hammering them in so they’re not at all secure. And, I got a wrenchy thing that’ll be just right for putting on the good shower head. I even stumbled on the pipe tape that I will need later tonight and regretted not getting and would have had to decide if I wait until tomorrow or just see if the remnants of old tape were enough. Hardware stores, art supply stores, libraries, used book stores. I think of all the indoor spaces these are closest to being a form of church for me. Even thinking about it, just lingering in the spaces, going slowly, considering, letting my thoughts and feelings simmer and start to reach a slow boil… My juices flow inside me and start wanting to come out and I have to let them out somehow and here I am now, trying. This entry was posted in mindful living, my own chautauqua, writing and tagged creativity, mindful living, writing by serenebabe. Bookmark the permalink.